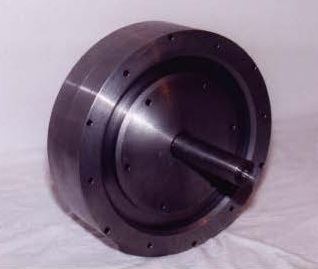 The cryogenic magnet motor of Walter Thurner represents a nice example of a self-running system which can generate usable energy. Its operation principle appears fairly comprehensible. Once it is understood one has an idea how a self-running system can work concretely, at least at the macroscopic scale. Furthermore, it appears worthwhile and instructive to try to recreate Walter Thurner's cryogenic magnet motor and develop a system that limits and controls its speed of rotation. (b) www.borderlands.de/net_pdf/NET0308S4-10 (in German). This article about Walter Thurner is published in the German-language journal NET-Journal , issue March / April 2008, pages 4 - 10. 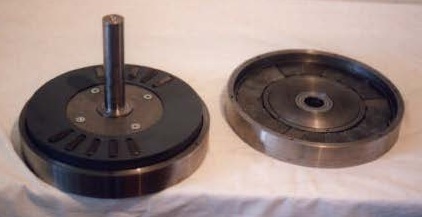 The cryogenic magnet motor is described on pages 8 and 9. An example of an embodiment of Walter Thurner`s idea is sketched above in Fig. 1 and Fig. 2. His concept implies a linear or especially a circular array of magnets. One of such a magnet (1) is sketched in Fig. 1 and Fig. 2. Another magnet (3) is attached to a rod (4) which is connected with a shaft (5) so that the magnet (3) can move above (1). The sketched arrangement of the magnets (1) and (3) results in a motion of (3) towards the edge of (1). A repulsion arises between (3) and (1) when (3) approaches the edge of (1) and an attraction occurs when (3) goes away from (1). Thus at the edge of (1) the magnetic forces act against the direction of motion of (3). That corresponds to a conventional or conservative system without any self-running motion. Walter Thurner`s concept enables a self-running motion of the movable magnet (3) because strong diamagnets (6,2) are placed at the edges of the magnet (1). The strong diamagnets (6,2) are realized by high-Tc superconductors such as YBa2Cu3O6.9 which is superconducting at the temperature of liquid nitrogen (77 K). Thus Walter Thurner`s device requires a cooling by liquid nitrogen. The strong diamagnet, for example (2), generates an induced magnetic field whose direction is opposite to the external field of the magnets (1) and (3) and thus it attenuates / shields / modifies the magnetic fields / forces of and between (1) and (3) at the edge of (1). Therefore (3) can leave the edge of (1) in a non-decelerated way. If (3) approaches then the edge of another magnet of the type (1), then the strong diamagnet (6) attenuates or shields the repulsive force between (3) and (1) so that (3) crosses the edge of (1) in a non-decelerated manner. Thus a circular array of several units of the type (6)(1)(2) leads to a self-running and self-accelerating motion of the movable magnet (3) from one magnet (1) to another. An increase of the effect can be achieved when not only one but more movable magnets of the type (3) are used. For example, several magnets of the type (3) can be placed on or in a rotating disc. The self-running and self-accelerating motion implies a generation of usable energy. For example, the rotating shaft (5) can propel an electric generator. Safety note: If the described device is constructed properly, then it is self-running and self-accelerating. 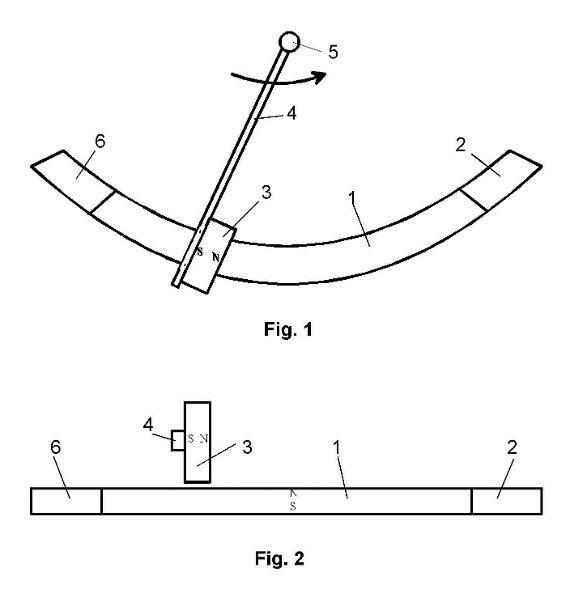 Without appropriate measures the speed of rotation can increase continuously until the device does fly apart ! That is of course very dangerous and indeed it did happen with a constructed prototype ! Fortunately nobody was injured during that event. Pictures from components of the prototype before its self-destruction are shown on the right. The visible holes in the lower picture allow a supply of liquid nitrogen. A renewed construction of this device requires the development of appropriate measures which limit and control the speed of rotation. The cryogenic magnet motor of Walter Thurner represents a nice example of a self-running system which can generate usable energy. Its operation principle appears fairly comprehensible. Once it is understood one has an idea how a self-running system can work concretely, at least at the macroscopic scale. It appears worthwhile and instructive to try to recreate Walter Thurner's cryogenic magnet motor and develop a system that limits and controls its speed of rotation. Devising a self-running system by considering the existing macroscopic forces does not require to know the source of the generated energy. Nevertheless, it is of course an interesting question from where the generated energy comes from. The author of this website assumes that self-running devices imply at the subatomic level an extraction of usable energy from an everywhere present energy which is called space energy, space-time energy, vacuum energy, or ether energy . The tapping of this form of energy occurs via physical fields such as magnetic fields .